HomeBlog September 2015 36 Free Pumpkin Stencil Template Printables! 36 Free Pumpkin Stencil Template Printables! Pumpkins, pumpkins, pumpkins! With autumn underway, we’re thinking of creative ways to give our pumpkins a personal twist! We’ve got 36 free printable stencil patterns to help you do just that - use these free patterns to carve, chisel or paint your perfect pumpkin design. All the designs are scaled to print out onto a standard 8 1/2 x 11” piece of paper, but you can change each design on a copier if you’d like to make them larger or smaller. If you're carving or chiseling your pumpkin, tape the template to the pumpkin and trace the design by poking holes into the paper to transfer the design with a pumpkin carving tool kit, awl, needle tool or even a ballpoint pen. Or if you'd like to create your own stencil to paint your pumpkin, it's easy to create one with an adhesive backed paper like Con-Tact paper. Tape the pattern under the adhesive paper, and cut it out with a craft knife. Alternatively, you could flip the Contact paper over with your design underneath. Place on a light box or against a window and trace the design on to the paper backing, then cut out with a craft knife. You can also use a stencil blank and stencil cutter to make a custom reusable stencil! Scroll down to download and print out each set of stencils. Once you click on each image, it will open as a PDF that you'll be able to print or save. 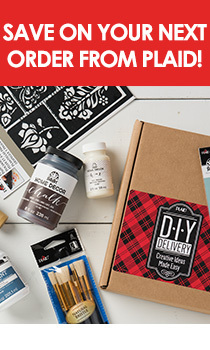 Be sure to tag us at #plaidcrafts to share your creations with us, and sign up for our email newsletter for more free DIY downloads and ideas. Monogram Set: Download the Large Alphabet Set, Small Alphabet Set and Large Numbers Set to mix and match for a super cute monogram. We love the idea of using the numbers on a pumpkin with your house number. Thought Bubbles: Get creative with these cool bubbles. Spooky Words: All the Halloween words you'll ever need. Friendly Fox: This adorable little guy will make anyone smile! Cutesy Crawlies: These are the bugs for any 'fraidy cats - they're way cuter than creepy! Funky Frames: Pumpkins deserve a chance to dress up too - disguise your pumpkin with these fun frames. Trendy Tribal: Not only will these be easy to carve, but you'll also have the trendiest pumpkin on the block with the Tribal Arrow Set.